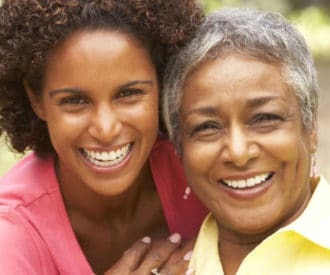 Keeping seniors with Alzheimer’s or dementia engaged, happily occupied, and in a good mood is every caregiver’s goal. After all, the better they feel, the smoother the day goes for everyone. Failure free activities improve quality of life because they give satisfaction and enjoyment. We rounded up 3 fun, senior-friendly games that are perfect for seniors with dementia. They’re inexpensive and easy to adapt for different ability levels. The best part is that these activities are flexible. 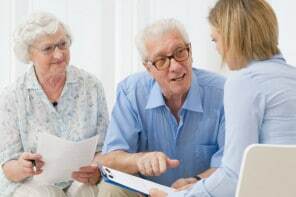 They can be played by your older adult alone, together with you, or with family as a group activity. 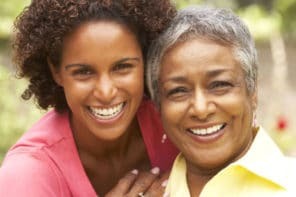 Games also help family members, especially children, have a successful visit where everyone has a good time. The basic idea of Skee-Ball is to roll a ball into a hole marked with a certain number of points. In our DIY game, we’ll use large bowls and bean bags. Label the bowls with different points and throw the bean bags into the bowls to score points. This is a game that your older adult can play from a seated or standing position. This game is especially fun with grandchildren! Place the bowls anywhere in front of your older adult, they don’t have to be arranged in the classic lineup. The goal is to make the game easy enough to be fun, but challenging enough so they’ll feel satisfied with the points they score. Use anything handy for the bowls, either ones that you already have, inexpensive aluminum food trays found at grocery stores, or plastic bowls found at dollar stores. You could make DIY bean bags are simple to make – here’s how to sew them, make them without sewing, or where to buy a set. If you prefer, mark off large squares on the floor with removable painter’s tape, assign points, and toss bean bags into those areas to score points. If your older adult used to love playing golf, an indoor putting mat is a great way to enjoy the sport again. They could putt sitting, like in the photo, or standing. They might already have golf balls and a putter, if not, get some inexpensive balls and putter. This simple stacking game is surprisingly addictive. 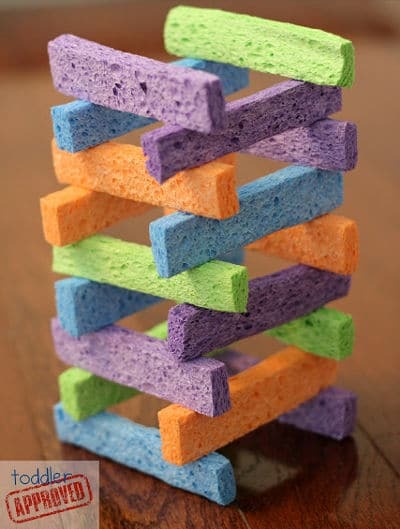 Just cut strips from colorful dry sponges and start building towers of any pattern or height.